Imagine for a moment that the promises of science fiction have come true and flying cars now enable human society to live in the air. You could move not only horizontally, but up and down too, taking advantage of the full three-dimensional space. There is just one catch: You cannot move faster than the wind. Instead, you, and those around you, tumble around, with your altitude and position entirely dependent on the vagaries of the winds. Though they seem so small and powerless, plankton are hardly insignificant. They are the foundation of the food web on which all life in the ocean depends, including the fish that end up on our dinner tables. They produce much of the oxygen we breathe in Earth’s atmosphere. They collectively draw huge amounts of heat-trapping carbon dioxide from the atmosphere into the ocean, regulating the climate of our entire planet. If we lived in a world where the winds determined our pathways and destinations, we’d crave more understanding of the physics that underlie our weather forecasts. The same is true for the oceans. If want to predict where and when productive plankton-rich areas will form, we need to learn more about the turbulent three-dimensional environment in which plankton live—the forces that govern where different species move and aggregate. When you hear a TV meteorologist talk about a cold front or a warm front coming through, you know to expect a rapid temperature change and perhaps a storm. It turns out that the ocean has its own underwater ever-shifting frontal systems, and these fronts can help us figure out where the plankton are. In the air, fronts form in the seams between those high-pressure and low-pressure systems you see all the time on weather maps. High-pressure air is denser, so it sinks; low-pressure air rises. When an air parcel rises, it cools, and the water it contains condenses and then rains out, causing storms. Something similar happens in the ocean. Some parcels of seawater may be colder or saltier than others, making them denser than surrounding parcels. Where there is a large density gradient, there is a fast flowing current, and the denser water slips below the less-dense water, which rises toward the surface. This vertical motion is critical for plankton. Tiny marine phytoplankton function like plants. They harvest energy from sunlight to convert carbon dioxide and other inorganic carbon into food and biomass and produce oxygen as a byproduct. But the two main resources they need, light and nutrients, are separated vertically. Light is highest at the surface of the ocean. Nutrients are most abundant in the deep ocean, because they are generated from decomposing organisms that sink from the surface. Water in the deep ocean, from the perspective of a phytoplankton, is a large compost pile that can provide nourishment. Fronts bring the two things phytoplankton need together to one place. As less dense water rises along fronts, it brings nutrients from the deep into the sunlit surface ocean. As phytoplankton flourish in these dynamic frontal zones, so do populations of zooplankton, the tiny marine animals that eat phytoplankton, much the way land animals eat plants. Zooplankton, in turn, are eaten by fish and whales, which also know to seek out fronts for a feast. To produce more accurate weather forecasts, scientists in the 1950s began to create numerical models. These are essentially mathematical equations that incorporate all the dynamic physics going on in our atmosphere. Numerical models for the ocean soon followed, and today they are used for everything from fisheries forecasts to projecting future climate. To start out, classic ocean models assumed that ocean currents are mostly two-dimensional. This is not a bad approximation at the large scale of an ocean, where Earth’s rotation and winds account for most of the motion of the water. This larger-scale approximation, with fewer details to factor in, also makes modeling much easier and requires less computing power. At smaller scales—more similar to the scale of a front where plankton communities form—the assumption that currents are mostly two-dimensional breaks down. Once computing power for ocean models increased, we learned that the oceans do have substantial vertical motion on small scales that ocean models previously could not capture. In parallel, most theories to understand ecosystems have been developed for life that is more similar to human life—on land and in two dimensions. On land, animals don’t have to contend with a moving environment. They can chart their own movements within their environment to seek out necessary resources. They can also store food away for later without it sinking miles down to the bottom of the ocean. This doesn’t hold true in the ocean. The validity of our models and theories limits our ability to make predictions about future states, whether that is the weather next week, fisheries this season, or the climate in the next century. We want to understand how ocean dynamics shape the diversity and distribution of plankton well enough, so that we can create models to predict how plankton populations—which are so critical to life on our planet—might change as Earth’s climate does. I am studying this phenomenon of phytoplankton communities at ocean fronts in a dynamic environment: the Mediterranean Sea. 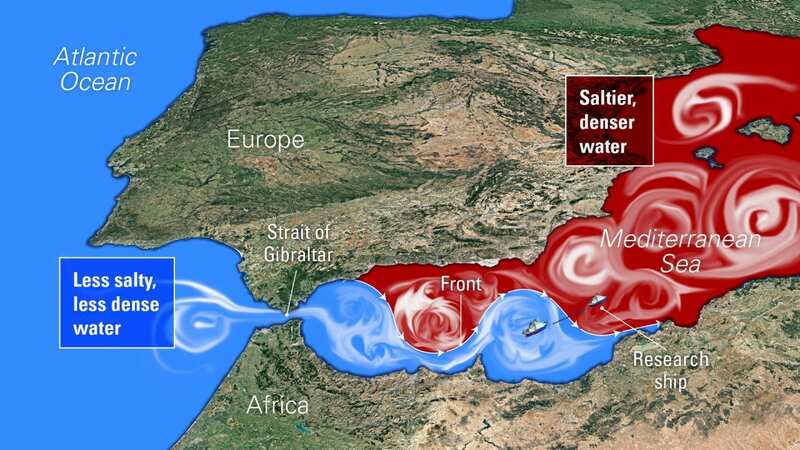 The Mediterranean is one of the saltiest parts of the world ocean. Water enters the Mediterranean through the Strait of Gibraltar and stays in the sea for years. Over time, the warm, dry Mediterranean climate causes fresh water to evaporate, leaving behind saltier, and denser, water. But water from the Atlantic Ocean continues flowing through the Strait of Gibraltar and into the Mediterranean Sea. This Atlantic water is relatively less salty and therefore much less dense than water that has been in the Mediterranean. This creates density gradients at the locations where these two water masses meet—the classic conditions to create a consistent front! 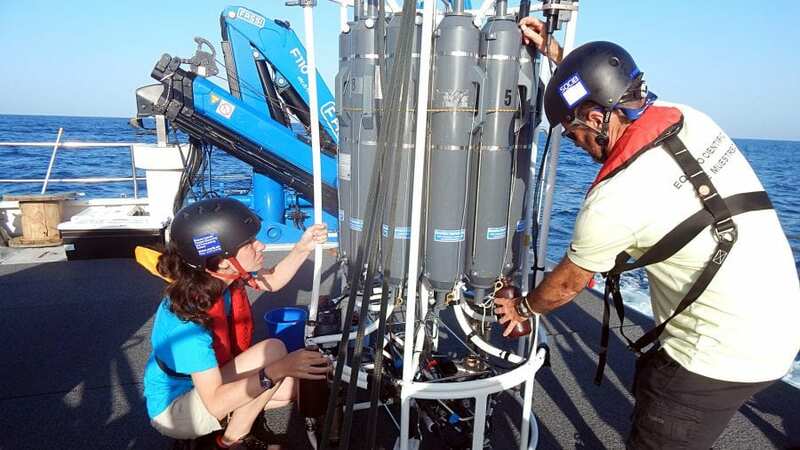 This makes the Mediterranean a reliable natural laboratory for studying phytoplankton communities at fronts. 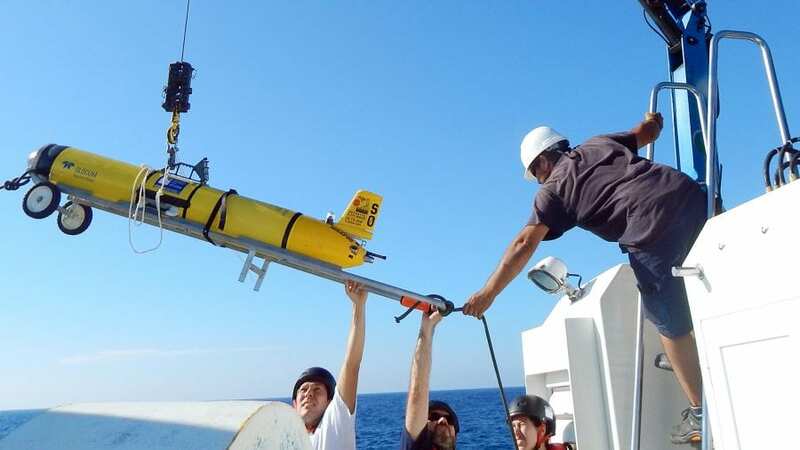 Aboard research vessels at sea, we survey expanses the size of major metropolitan areas, lowering bottles into the ocean and closing them remotely to take water samples at different depths. 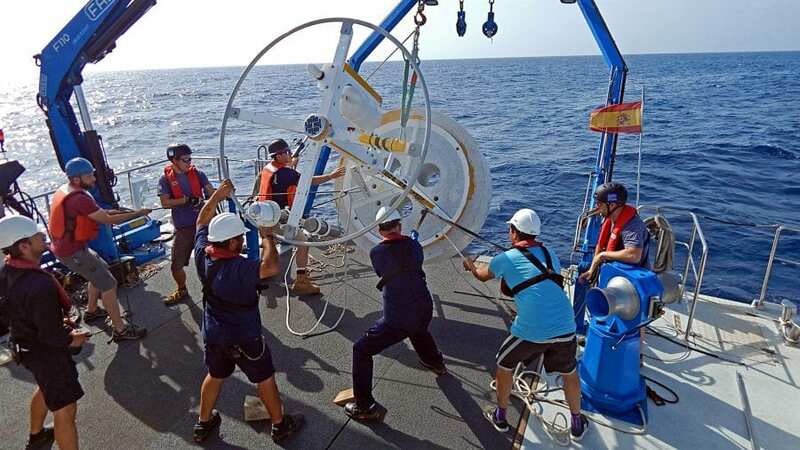 We measure the temperature and salinity every few hundred meters (a distance equivalent to a few city blocks) in the upper 500 meters of the ocean. To reveal plankton communities, we measure chlorophyll, the pigment that cells use to harvest light. On shore, we count the cells and classify them into different types. Below the smooth surface of the Mediterranean, we reveal an incredibly dynamic and heterogeneous environment. We can identify water originating from very different locations flowing side by side, indicating very active currents. We find different plankton communities inhabiting different spaces. Some phytoplankton grow better where vertical motion along fronts is relatively fast and, consequently, nutrient supplies are larger. These phytoplankton tend to have larger cells. Their cells have a larger volume to store nutrients for times when the nutrient supply declines, but less surface area for that volume to absorb nutrients, because they can more leisurely absorb the abundance of nutrients. Other plankton grow slowly, but they can maintain their populations when nutrients are relatively sparse. The observations from our research cruises give us a picture of conditions at given times and places, a snapshot of sorts. But currents are dynamic. Phytoplankton communities, or particular assemblages of species, may also be carried along with the currents and run into one another. How might they compete when they meet up and how will that ultimately affect which species thrive and where? The Earth system is so intricate that isolating the effects of any one component is enormously difficult. That’s where modeling comes in. We integrate our real-life observations into numerical models that combine the dynamics of both ocean physics and biological communities. Models give us a more complete picture of what happens in the ocean. They are tools that we use to develop better predictions of how changing environmental conditions may affect what could happen in the ocean—and how these may affect our fisheries and our climate. In the end, it is the interplay of biology and physics that sustains life in the ocean—and on our planet. 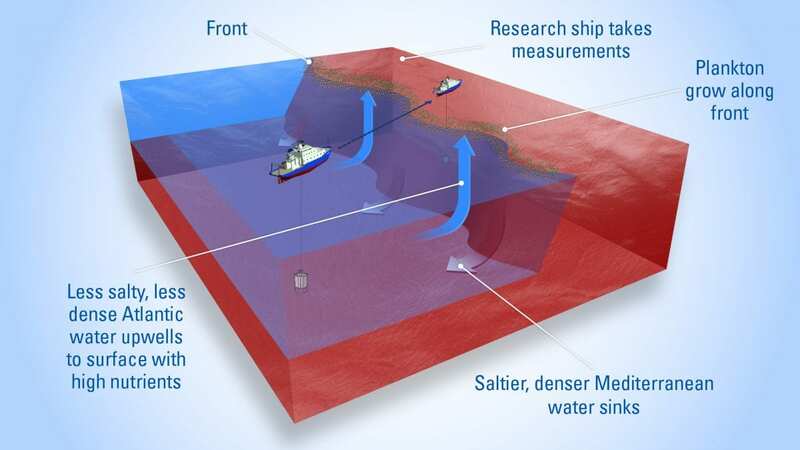 This research was funded by the Office of Naval Research and was conducted by WHOI in collaboration with Spanish research institutions IMEDEA (CSIC) and SOCIB in the Balearic Islands. Mara Freilich was also supported by the J. Seward Johnson Fund.